The Orchid Column: Where do I cut my Cattleya after it blooms? Where do I cut my Cattleya after it blooms? I'm glad you asked! It's important to know where to cut your Cattleya spike after it flowers. Cattleya anatomy is a little quirky and it is easy to make a mistake. The good news is that there's really just one bit that requires an introduction--the bud sheath. Once you are able to recognize a bud sheath, deadheading a Cattleya or its close relative Laelia is a snap. So grab your favorite cutting tool and follow along! 1. Locate the bud sheath. Have a look at the photo above. Both flowers are supported by a vertical spike. The upper part of the vertical spike is visible emerging from the top of a green bud sheath. The sheath is sealed on two sides and open at the top. The lower part of the spike is faintly visible in silhouette through the backlit bud sheath. The purpose of the bud sheath is to protect the young flower buds as they develop. It remains in place even after the flowers are spent. Bud sheaths are green or papery brown. Cattleyas and laelias are stealth bloomers--in many species the bud sheaths appear months before blooming, with the buds emerging just a week or so before opening. The flowers often take me by surprise. 2. Look carefully! If no flowers or old spikes are visible, carefully examine the bud sheath to make sure that it is an old sheath. You don't want to accidentally remove a sheath full of young buds. 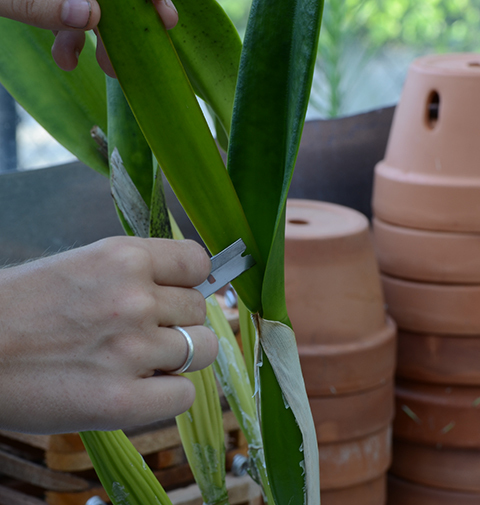 Gently squeeze the sheath to make sure that there are no buds inside. The color of the sheath is not a reliable indicator. 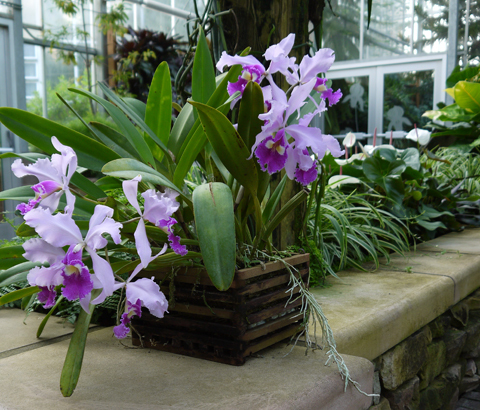 Some orchids, like the Laelia pictured above and below, have sheaths that remain green after the flowers are spent. Others produce bud sheaths that turn papery brown while the buds are still developing inside. 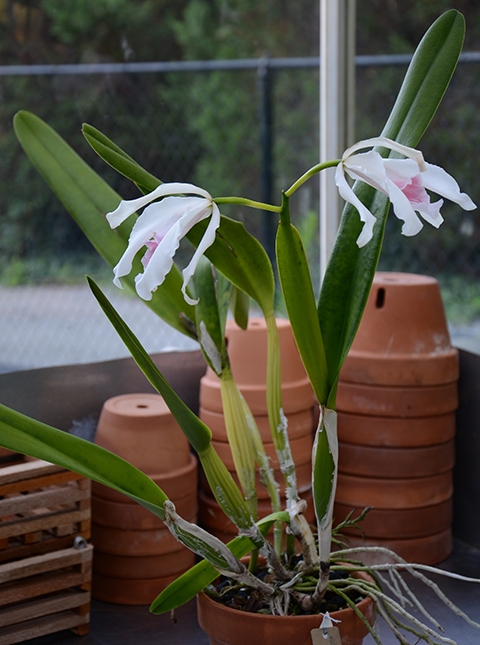 Each mature shoot--the pseudobulb, leaf and bud sheath--produces just one flush of flowers during its lifetime. If you can still see the old spike with its spent flowers you needn't look for a second flush of buds inside the sheath. The show is over. It's time to remove the spike and sheath. 3. Find the spot where the bud sheath meets the stem. The bud sheath and its flower spike originate at the top of the stem (pseudobulb) and they are surrounded by one or two leaves. 4. Position your cut as close as possible to the base of the leaf. 5. Make the cut through the sheath and spike. 6. Examine your plant for more old sheaths. Any pseudobulb that matured recently could have a sheath. You can use the same cutting tool to remove all the old sheaths on that plant. That's it! Don't forget to safely discard or clean your cutting tool before cutting another plant. Why is it important to remove old sheaths? Prompt deadheading of cattleyas and laelias is a high priority in our greenhouses. Old bud sheaths often fill with water and bacteria, becoming bags of icky aqueous goo. You can get away with being lazy about deadheading your Oncidium, but not your Cattleya. Wondering where to cut your Dendrobium? Find out here. 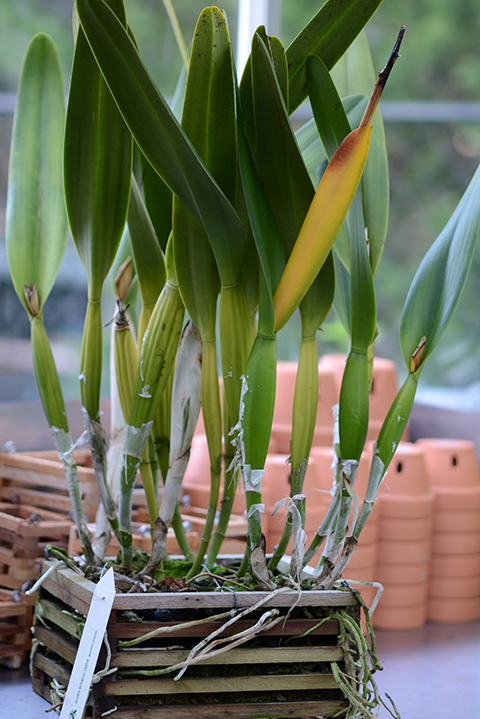 Click here to find out where to cut your Oncidium spike. Go here to learn where to cut a Phalaenopsis spike. Once a cattleya stem blooms and you cut the flower off after it's done. Will the stem rebloom?